The genesis was tedious. The French breeder Henri Bouschet began in 1855 in Mauguio (Hérault) the varieties Petit Bouschet (Creation of his father Louis Bouschet) and Alicante ( Garnacha Tinta ) to cross. This year, Alicante Henri Bouschet and Alicante Bouschet No. 2 were created. 1. Ten years later he repeated the intersections and created the varieties Alicante Bouschet No. 2, 5, 6, 7, 12 and 13. 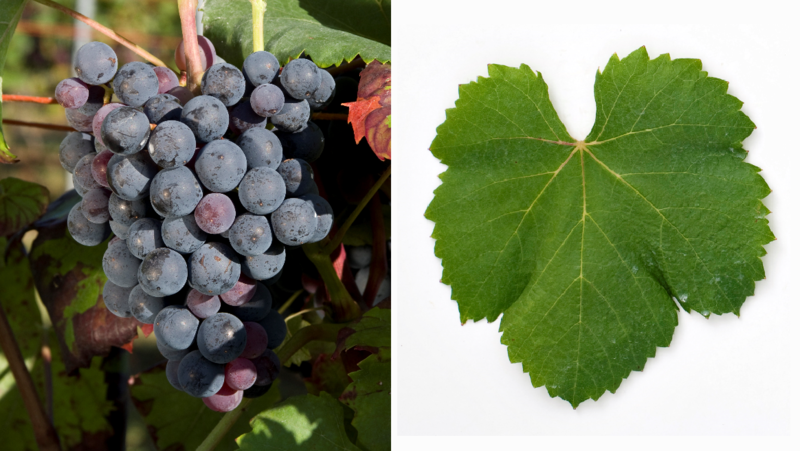 All these were very similar morphologically, but produced different wines. Finally Alicante Henri Bouschet (from 1855) and Alicante Bouschet No. 2 (from 1865) remained, which are not distinguishable externally and often mixed in vineyards were planted. In practice, you make no distinction and the variety (s) usually simply as Alicante Bouschet. The early ripening, high-yielding variety is resistant to the real mildew, but prone to downy mildew, Flavescence dorée and Black spots disease, as well as sensitive to drought, Due to the red colored pulp and the strong coloring grape skin it produces dark and extremely bright red wines (but there is also one mutation with colorless flesh). Therefore, it is mostly in the blend as teinturier (Dying grape) and was formerly used in France in the vineyards in the so-called composite rate together with the poor-colored variety Aramon Noir grown. In France the variety became after the phylloxera very popular. At the end of the 1980s, the acreage was just under 16,000 hectares, but shrank by 2010 to 4,322 hectares. The variety is mainly in the Languedoc in the department Hérault (about 50%), the rest in the Jura and in the valley of Rhone grown. It is also used for the production of grape juice. In Spain In the year under Garnacha Tintorera a total of 19,551 hectares were planted. More than half of them are in the region La Mancha, the rest especially in the regions Galicia (over 6,000 ha) and Valencia, There were also other stocks in Europe Greece (56 ha), Italy (645 ha), Romania (20 ha), Portugal (3,322 ha), Turkey (488 ha), Hungary (21 ha) and Cyprus (80 ha). In the United States she was during the prohibition (1920-1933) exceptionally popular for the production of wine, because the thick-skinned berries were ideal for long transports. Many companies and hobby winemakers sourced grapes and made wine. In California it was widespread until the 1940s, today are still planted about 400 acres (Central Valley). Other countries are overseas Algeria (3,020 ha), Argentina (166 ha), Brazil (129 ha), Chile (4,228 ha), Morocco (1,098 ha), South Africa (10 ha), Tunisia (842 ha) and Uruguay (22 ha). The variety occupied in 2010 a total of 38,371 hectares of vineyards with rising tendency (in 1990 it was about half). It thus proved in the worldwide varieties ranking the rank 23. This page was last modified at 7 April 2019 at 06:38.